Dark Souls, the spiritual successor to PlayStation 3 exclusive Demon Souls, has a certain stigma to its name that has become clichè beyond repair. While this may sound like a bad thing, the fact of the matter is that creator and director Hidetaka Miyazaki’s most famous piece of work has been so incredibly influential, it’s impossible to avoid what has now become a common terminology in many modern games that entice such challenge. With that said, I myself have fell victim to referencing the infamous series on numerous occasions. However. I do have one big confession to make. I have never actually played a Dark Souls game. One thing that did occur to me when delving into this hellish medieval land was that despite now being seen as a prominent genre of its own accord, this cultural phenomenon has more in common with a particular Nintendo IP than first meets the eye. The IP in question is none other than The Legend of Zelda series – or more notably, the favourite child, The Legend of Zelda: Ocarina of Time, and the black sheep of the family, Zelda II: The Adventure of Link. The game-changing Z-targeting system found in The Legend of Zelda: Ocarina of Time can be seen as the core underpinning blueprint to the combat in Dark Souls Remastered. Clearly, it’s not quite as merciful within its structure and there is much more variety for the hollow protagonist to play with. One thing’s for sure is that everything in your primary combat manoeuvrability has a purpose and utmost importance to handling the dire fate that lies ahead. Grasping a long sword with two hands, for example, can dish out greater damage than when wielding the blade with one. Yet the sacrifice of a shield, as a result, will see to it that your dodging game must be as sharp as a razor if you plan on staying alive. 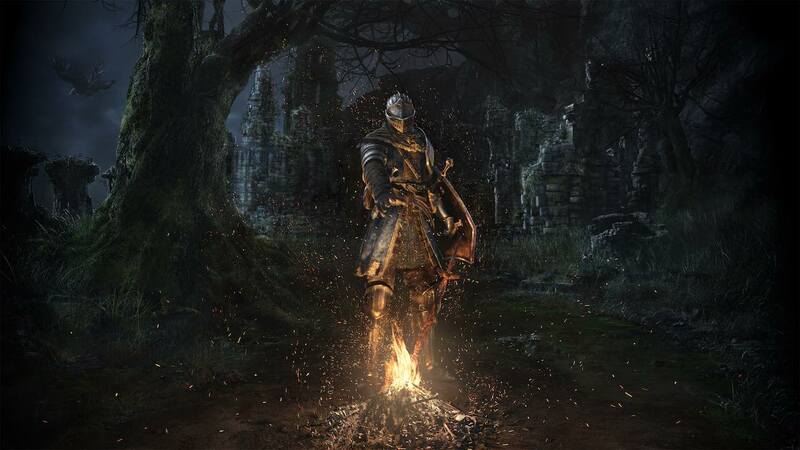 Where Dark Souls Remastered ultimately evolves the combat mechanic is in how everything that you face requires a tactical approach that you must mould towards. Your strategy is your own, as is the way you shape the character that you are using. I personally went with a sword-slinging warrior class as opposed to a Copperfield magical mage, as I’ve never been a big fan of wizards and sorcery. Regardless of your own choice, what does stand truly apparent on common ground is that you will certainly meet your maker far more often than not. It goes without saying then, that Dark Souls Remastered is an incredibly difficult game for a noob to the series like myself. My lack of personal time would usually get in the way of investing into something with such a formidable reputation. Delving into the dark lands of Lordran on the Nintendo Switch was well worth the wait. The whole flexibility of the hybrid console allowed me to find the elbow room needed to soak in all that the world has to offer. I would often find myself switching on some David Attenborough on Netflix knowing that my significant other will drift off into a heavy slumber. Rather than creep downstairs into a cold, empty sitting room to grab my fix, I could simply reach for my headphones and the portable home console next my bed to carry on forward with the next goal I had set in mind. It’s within the small personal landmark achievements where Dark Souls Remastered completely gripped me. Facing what seems to be an impossible challenge would keep me coining up various possible algorithms even when I wasn’t playing. If something became far too challenging for me at any given moment, I would venture back towards familiar territory to farm for souls and stumble upon secret pathways leading into new dense and interesting areas. In doing this, the game not only reminded me of Zelda II: The Adventure of Link, but also blew my mind at how wonderfully interlocked the whole world is. In Zelda II: The Adventure of Link, every time the entity of Ganon looms over you during the game over screen would resort in the player having to start right back at the very beginning of the game. What had kind of balanced it all out was how anything significant to progression would save over to the next run. One familiar feature in particular was how XP was earned. You would usually rack it up by defeating enemies to meet a set quota to improve your stats permanently. If you were to die before that target is met, you lose all that is earned. Love it or hate it, the game in that regard was evidently ahead of its time. In a similar fashion to the NES sequel, one of the more famous mechanics found in Dark Souls Remastered is the ability to reap souls from all those that you have slain. An acquired number of souls are needed in order to level up the relevant stats to match your play style, along with possessing a currency value to aid you on your journey. However, dying before reaching a checkpoint bonfire to spend them will allow for one more chance to claim them all back. Meeting your demise before you can retrieve them will result in them being lost forever. With checkpoints few and far between, avoiding death becomes a nerve-wracking test of will with a wealthy wallet of souls in your back pocket. On top of that, all the standard enemies will respawn back in an effort to cause havoc every time you rest to get the marshmallows out. The good news is that death isn’t always in vain. Just like in Zelda II: The Adventure of Link, you will keep any significant items that you have collected while formidable bosses that you have defeated aren’t stirred back to life. This is where I chisel in the banal phrase of any Dark Souls Remastered review to state that “every death is a learning experience.” It is, after all, the demonic hook that the Souls series is predominantly well known for. It’s also here where the unconfined genius of excellent craftsmanship shines its brightest. Everything that the player runs into from the beginning to the end can come across as utterly unforgiving and almost unfair at times. The sneaky traps that can be set in place to instantly kill the player can seem deceitfully relentless on the surface. Except, it really isn’t. It just appears to come across that way. When a nasty surprise chews away the life of the fateful protagonist, it’s a lesson for the player to know better for next time. Fool me once, and all that. Trying to overcome a bad situation could feel like I was banging my head against a wall. Finally finding the solution to the said problem would send the endorphins and serotonin levels in my brain into a frenzy. I even claimed an unintentional victory that had me celebrating like a giddy six-year-old winning a sports day event. Parrying a charging heavily armoured boar into a fire, I then watched as it roasted to death – the perfect deus ex machina moment leading to a temporary happy ending. Considering that my weapon of choice was dealing minimum damage on the hog beforehand made this surprising outcome so much sweeter. Needless to say, Dark Souls Remastered isn’t for everyone. The game demands a certain level of patience and concentration that may not abide well with some. The constant journey from a bonfire save point to where your souls lie dormant may also prove to be tedious. There are plenty of shortcuts and resting places to discover to make the trek back a little less gruelling. Just don’t go in expecting them to be handed to you on a plate. You see, from the very get-go, the tale works to intimidate the player without apology or consideration. There’s no hand-holding here, no paint-by-numbers approach or any intention in caring whether or not you make it to the end. Not everything that you discover needs to be used in order to succeed, yet everything has purpose enough to be evaluated, researched and respected. When The Legend of Zelda was originally released, it was known to conjure up playground conversation between friends to share information about their own discoveries and hearsay. While the servers were not switched on during my playthrough, the modern privilege of congregating online lights a similar candle to what had burned way back in the 80s. Messages from players can be plastered on the floors to either troll or assist fellow hollows who are seeking to claim back their own humanity. Some strangers may even dive into your world with the motive to hunt you down themselves. I never experienced such online threats when writing this review. However, the game still sees to it that artificial intelligence can invade like a Skynet knight with a hungry sword. Because this is my first playthrough, I honestly can’t compare this remastered port against any others. What I will tell you is that the game runs at 30 frames per second as opposed to the 60 frames per second found on other consoles. For me personally, this was never an issue. In fact, I barely ever noticed. Besides a few very slight frame drops and audio hiccups every once and a while, I found it be an overall smooth and unnerving experience. The polygons that make up the world do show their age a bit, but the shadow effects, interesting level design and the huge variety of imaginative enemies keep this remastered world feeling organic. I never felt like I saw any sacrifices for the privilege of playing in Handheld mode aside from the 720p output in comparison to the big screen 1080p benefit. If anything, I simply felt equally engrossed whichever way I chose to spend my time with it. The load times between deaths are much more tolerable than what I’m lead to believe the original game had. You have just enough time to read the handy on-screen tips or recollect your thoughts before you are launched right back into the darkness. Dark Souls Remastered has built a reputation for its sadistic design. This can certainly be the case for anyone that dares to dive headfirst into danger without a second thought. What I took from the experience was a simulated life lesson in paying attention and thinking for yourself to work out how to smartly move forward to achieve small ambitious goals. Sure, the difficulty curve can seem daunting, but there is an answer to everything as long as you’re willing to experiment. With all that said, there’s a reason why Dark Souls has become such a massive influence in the games industry. Even The Legend of Zelda: Breath of the Wild tears a length of parchment from the Dark Souls scroll with its approach to survival – a turn of the table in that regard. The be all and end all is that the hype, for me at least, is real. As was the kaleidoscope of emotions that came with it. I may have missed the boat back in 2011, but I sure am glad to have had the chance to experience this incredible journey for the first time on the Nintendo Switch.